Keep up the energy at your next event with one of Toronto's best DJ's. Subscribe to TSEvents e-news for great event intel. delivered to your inbox. 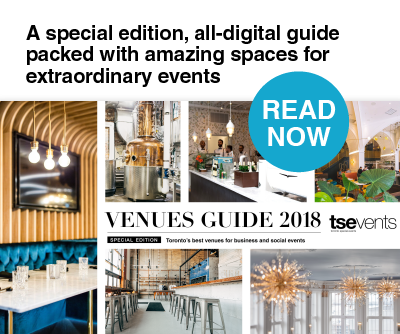 As a FREE subscriber to TSEvents e-news, you’ll receive a heads-up email with highlights of the latest edition. Visit great city venues without leaving your office. Keep your finger on the pulse of emerging trends. Discover unique event suppliers. Get ideas — get TSEvents e-news! If you are planning a team retreat, here are 10 ideas to ensure success based on our experience and the good advice from our friends at the Harvard Business Review. Choose from sedans, SUVs, limousines, club vans, shuttle coaches, luxury coaches and highway coaches. Luxury Coach is your full-service transportation company offering a wide selection and exceptional service. All vehicles owned and operated by Luxury Coach. Expecting several hungry guests at your next #event? Chair-man Mills Corp has been the premier rental company in Toronto since 1911! They provide the best selection of chairs, tabletop decor, linens, etc. Contact them for an appointment in their showroom where their decor specialists will be happy to assist you.